Dishonor! Dishonor on me! Dishonor on my family! Dishonor on my cat! Can't believe I lost my Kindle in my bedding last night, so then I couldn't find it this morning to take to work, so I lose a whole day's worth of reading time, so now the library is telling me that I have 39 hours left on my digital loan period and oh by the way the next book in your hold queue is available for download. 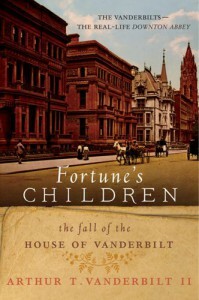 Vanderbilts, darn your whole family, why couldn't there be an autobiography or collected family memoirs? Would be more interesting than this hodge podge of cut-paste anecdotes. Sigh.